Each year, universities and research centres – most particularly the major space agencies such as NASA, ESA, and NASDA – devote a vast amount of time and money into the research of materials behaviour and production in microgravity. Recently, the possibility of creating special alloys, inorganic and organic crystals, as well as biological (living) tissues in this condition has been investigated. Fluids, Materials and Microgravity provides a solid basis of established knowledge – through literature, fundamental studies, experimental methods, numerical (basic and sophisticated) techniques – as well as the latest in research advancements. 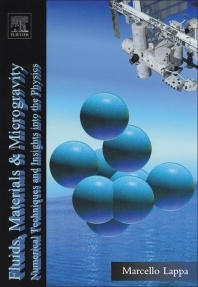 Important for the prediction of material behaviour when exposed to the environment of space, this book explores the new knowledge provided by microgravity-based studies in producing unique inorganic, and organic materials on Earth (and in designing related new technological processes). A vital resource for any scientists interested in the understanding and modelling of the new important physical mechanisms disclosed by microgravity research, and in their possible effect on the production and behaviour of materials both in space and on Earth. A vital resource for any scientists interested in the effect of microgravity on the production and behaviour of materials.